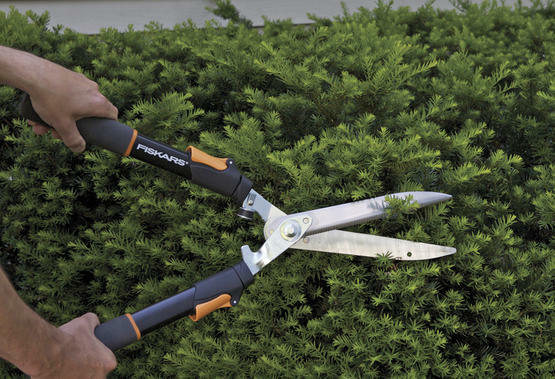 To keep those hedges and bushes in tip-top condition, manual shears are the way to go. I know what you’re thinking—an electric hedge trimmer is easier and faster. However, they lack the finesse and accuracy of your back-to-basics hand shears. Features Quality of Cutting Are They Worth Buying? These shears are designed to make your gardening work much easier, with features that separate them from the rest of the crowd. Let me take you through the detail on these clippers and see if they actually do make shearing simple. These shears have a patented four-point pivot “power-lever” mechanism, which amplifies the cutting strength with each trim. This means that less energy is required during cutting, effectively doubling the shearing power. The eight-inch cutting blades may not be as long as on some other shears, although what they lack in length, they make up for in features. Firstly, instead of smooth edges, these blades are serrated. Not only does this mean more cutting power, but also enables stubborn branches to be held tightly. This reduces the likelihood of slippage, which can happen when you’re cutting through thick or damp wood. Secondly, the steel blades are coated with chrome. This gives the shears a nice, clean look but, most importantly, prevents oxidation—a common issue with outdoor tools. What’s more, these blades self-sharpen, meaning your shears are always in top condition. The pointed blade tips enable accurate and delicate pruning of bushes and shrubs—a useful feature if you are a budding topiarist looking for that perfect finish. If you’re unsure about how to shape shrubs, here’s a handy video to help. Using these shears is a very comfortable experience. The handles are finished with oversized, cushioned hand grips. This reduces fatigue and allows a tight grip to be maintained, even in damp conditions. A shock-absorbing bumper reduces unwanted arm vibration during cutting and reduces the risk of trapped fingers. The shears are designed with black handles that have an attractive orange trim. This, combined with the shiny chrome blades, gives them a modern aesthetic. For peace of mind, these shears come with a lifetime warranty. These shears may sound impressive, but how did they perform when put to work? Slicing my oriental grass was simple. It easily handled over ten green shoots at once, but as they are thin, you would expect that. However, what did impress me was the cleanliness of the cut. There were no jagged edges or fibrous remnants. What’s more, grasses are notorious for sticking to blades and clogging them up. Yet, even after ten minutes of cutting, I did not have to clean these blades. The chrome coating acted almost like a grass repellant, keeping them clear. On my ground shrubs, I started to appreciate the “power-lever” feature. Cutting branches of around half an inch wide definitely required less effort than what I have become used to. The cuts were accurate and clean, although it could only handle one branch of this thickness at a time. The shears did begin to fall down when cutting the branches of my fruit tree. Admittedly, they are nearly an inch thick, and loppers would really be the correct tool. I did manage to cut through though the serrated edges helped and it did take three to four cuts each. If you’re challenged in the strength department, these shears could be a good choice. The “power-lever” feature means that the effort required for cutting is halved—making them ideal for seniors. In addition, these shears only weigh four pounds. Handling them for extended periods shouldn’t cause too much fatigue, even if you’re stretching for the higher branches. While the pointed blades are good for intricate work and styling, they would not be ideal for covering large areas. Hence, if you have an expansive hedge, it might be better to look for shears with around a 10-inch blade length. 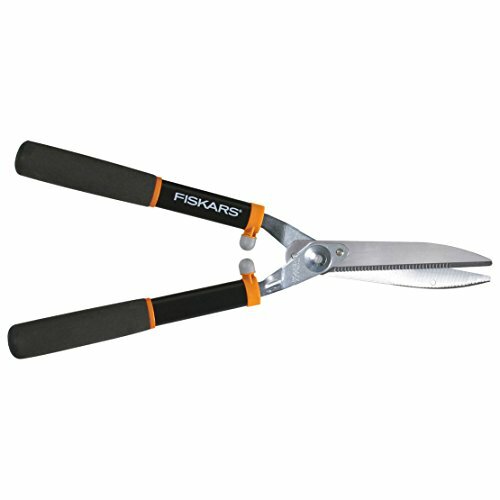 These shears will easily handle branches up to a half inch thick. This would make them ideal for a garden consisting of grasses, boxwood hedges, medium shrubs, and small fruit trees. The self-sharpening feature may appeal to those who don’t have the time and/or the inclination to prepare their tools before use. Although the shock-absorbing bumpers should prevent finger damage, I found that my knuckles did clash together on occasion. I do have large hands, though, so they may not be ideal for people well-endowed in that department. This is a good pair of shears for a smaller garden—where accuracy and quality of finish are more important than volume. The “power-lever” feature means that cutting is easy, assisting those who sometimes lack the strength to cut through the larger branches. With self-sharpening blades, which—thanks to the chrome coating—do not require regular cleaning, these could be a welcome choice for the laid-back gardener.